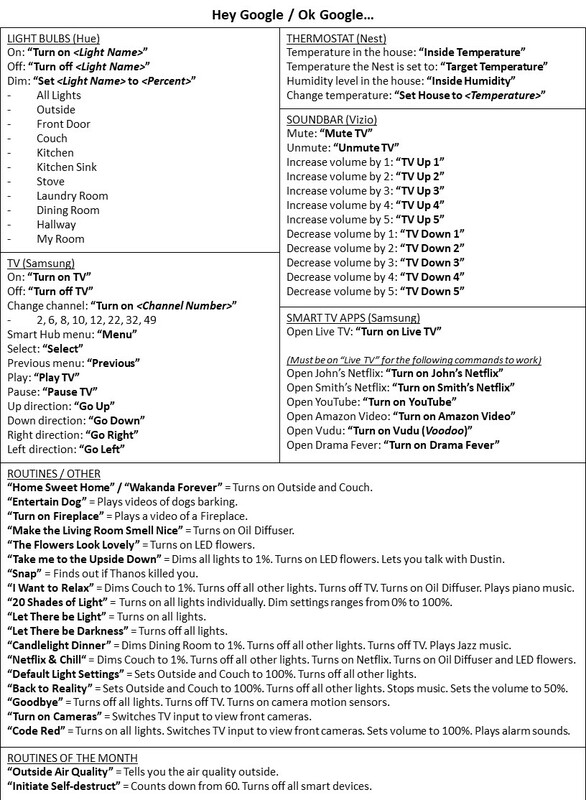 A reddit user /u/reddit_in_portland automated his home using google home and created a menu card with all the voice commands he used to control his smart-home. His setup is a combination of Hue, Nest, Smartthings, Harmony, and some other smart devices! Using Harmony Hub, He created an "Activity" using the Hub that uses the direction buttons on your remote to navigate to that Netflix account and select it. Wherever the Netflix app is located on your TV, it's just going to that location and selecting, etc. Profile 1. Harmony Hub Activity: go right, go right, go up, go left, select. Profile 2. Harmony Hub Activity: go right, go right, go up, go right, select.